Of course, I had to add some glitter to the snowball as well! Easy little snowy card to add to my stash! I hope you’ll find time in your busy schedule to create a snow-filled card and play along with us this week too! 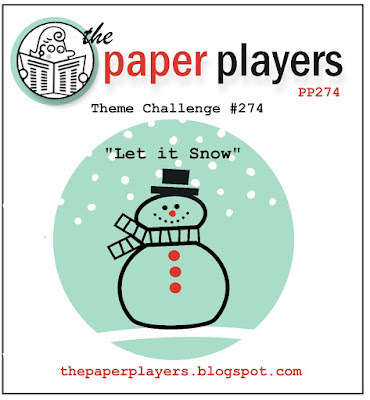 Be sure to check out all the designers’ creations at the Paper Players blog for lots of fun inspiration! What cuties - both the elves and your own little imp! A lovely little scene and your glitter and sequin embellishments finish it beautifully LeAnne. Here's to a good, if busy, week! What a sweet card! Love your image of the kids playing in the snow, reminds me of the fun we had playing in it when we were kids! :) Fantastic layering and design. What a cute little pair they are, almost as cute as Cassidy! They remind me of the Campbell's soup kids!! So cute, LeAnne! You are the queen of vintage images and this one is adorable. Love the expression on the face of the one rolled into a snowball--imps is right! What a gorgeous vintage image, LeAnne! I love the bit of sparkle on the snowball.